What Boat Should I Build? “the desire to build a house is the tired wish of a man content thence forward with a single anchorage. 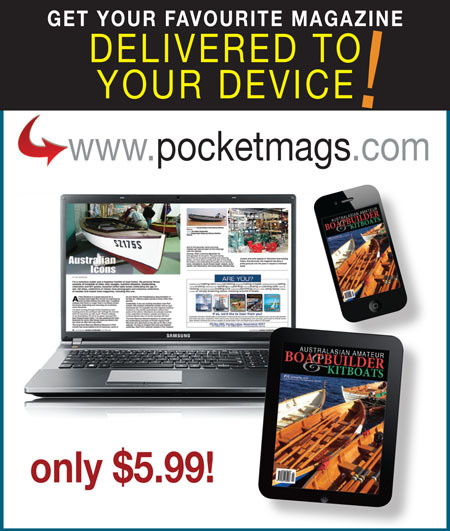 I guess it is fair to say that most people reading this magazine are either building their own boat are are planning to sometime soon. For many potential builders it is not a question of whether they will build a boat but what boat they will build. I suspect that for some people the actual building of the boat is more important than the sailing of the boat when the project is finally finished. One question I am frequently asked by people who contact me about a kit boat ask is what is the best design for them to build. It is a complex question and I don’t really think there is any easy answer to it. Apart from the technical aspects of building and using the boat, there is also the question of why they want to build at all. While you may not always be able to build a new boat for the price of a secondhand boat, the great advantage of self building is that you get to decide how your boat is constructed and, more importantly, you don’t inherit the mistakes and short cuts of previous owners and builders. But as well as that I think that for many people there is an inherent desire to build things, something in our DNA, a kind of throw back to a time when we needed to be more self sufficient than we are nowadays. For some people it may be a piece of furniture, or a car, or even a house, and for some of us it is the desire to build a boat and all the possibilities that go with it. In some ways a boat is the epitome of the desire to build something, not only must it be watertight and keep its crew safe in what can sometimes be a very hostile environment, it must also be able to work with sails or motor to move through the water efficiently, and hopefully it will be beautiful to look at too. No small challenge, for the designer as well as for the builder! 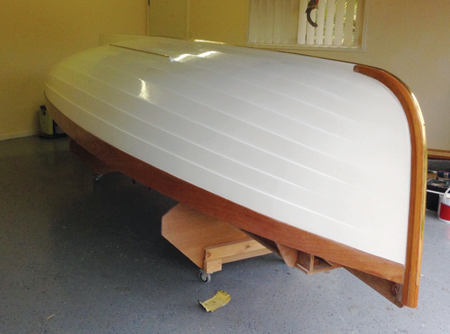 Modern boatbuilding has become significantly more accessible to amateurs with the advent of epoxy resins, and also almost all the information a builder could need can be found somewhere on the internet. 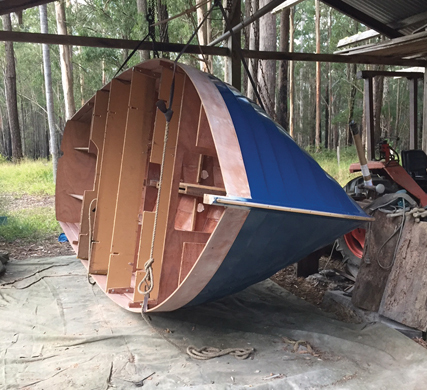 A few years ago I sent an Ilur kit to Gary Barker in Queensland and at the time he confessed that he was a bit nervous as he had never built anything like a boat before but he was definitely game to give it a go. I told him that he could contact me with whatever questions he may have or any problems or issues he found and I would be happy to help him. I didn’t hear anything from him for several months and then one day he sent me a beautiful picture of the completed hull. I was surprised that I hadn’t heard from him and that he hadn’t needed any help and when I asked him about this he said that he had found all the information he had needed online, particularly on forums like the wooden boat forum. Jewell cabin with step on the centreboard case. And although there is no easy answer to either question I find that a good rule with all boats is to go for the smallest boat that fits your purpose. Firstly “can I build it”? Obviously a person’s individual skill will play an important role in determining whether they are able to build their boat and for a complete novice it can be a good idea to build something really small and simple just to get used to the materials and tools used to build a bigger boat. Epoxy resins have made boatbuilding easier but building a boat can still be a complex business even with a CNC cut kit, and some methods of construction are more complex than others. Probably the easiest method of building a boat is the ‘stitch and glue’ method and very big boats can be built this way. Strip planking, cold moulding and clinker ply are also all common, and of course CNC kits can greatly assist in all these methods. For the very ambitious or skilled there is always traditional planked boats, either clinker or carvel, but for the vast majority of home builders these methods of construction are not practical. Ebihen hull being turned over single handed. Although these modern methods of construction can make construction easier there is also the complexity of the design to consider – too ambitious a project can end up with the builder getting bogged down and losing momentum. Ultimately a builder needs to judge whether their skill level will be enough to complete the project but it is worth remembering that even if your skills are limited at the beginning you are likely to learn a lot and improve over the course of the project, and anyway, sometimes facing up to such challenges is what gives us the greatest satisfaction when the project is finally completed. The other big consideration when taking on a project like building a boat is your workspace; how big is it and what tools and facilities you will need. Building in a small confined space can be very frustrating and room for laying out parts as well as rolling over the hull if necessary, dust extraction, moisture control, storage of materials etc, all need to be considered. I have heard it said by other professional boatbuilders that when building a new a boat the workshop needs to be three times the area of the footprint of the boat being built, but most home builders don’t have the luxury of that much space and have to work within whatever space they can manage. The building jig for Gary’s Ilur was very robust so he was able to mount it on casters and move it around in his garage (which was the tidiest building site I have ever seen – see lead image). Whereas the Ebihen (above) was built in a semi open workshop in rural New South Wales, definitely a challenging set up in terms of moisture control but with lots of room available. The second consideration, ‘is this boat suitable for my needs’ is even harder to quantify. Again I would begin with the principle of going a small as possible, there is no need to build a big solid sea-boat if you only want to potter about in sheltered waters and a lighter easier constructed boat will probably get you on the water sooner and get used more. Hurt Stenross' Ripple waiting for the tide. If you are intending to go out to open water then you need to choose a suitable design but a question people often ask is whether a particular design is seaworthy enough. It is commonly said that the main consideration for seaworthiness is not so much the boat as the people sailing the boat but that is something that the skipper must judge for themselves. One factor that all skippers can achieve is to ensure that their safety equipment, EPIRB, VHF flares etc. are all functioning and by observing safety procedures such as informing coast guard or other responsible persons of departure, destination and estimated times of arrival etc. But from my point of view as a builder the main concern is the design itself. Personally I like high freeboard in a boat for open water, positive buoyancy so you know that even in in the worst scenario the boat willnot go to the bottom. Franscois Vivier’s Ebihen and Ilur designs are the most popular designs of that type that I deal with but within my sailing friends there is a wide array of similar boats. John Welsford’s Navigator and Pathfinder being the most common as well as Swallow Boats Bay Raiders but there are many other designs out there. I had always subscribed to the idea that seaworthiness and displacement went hand in hand and, that for a boat that was to be used in open water and able to cope with the conditions that may arise, weight and displacement were your best friend. However several years ago I found myself on the ferry to the Wooden Boat festival in Hobart inthe company of Robert Ayliffe. We spent some time discussing various aspects of boat design and seaworthiness and his opinion on this was that the opposite could also apply. 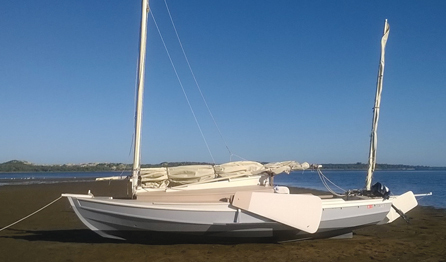 He recounted his well publicised trip across the Bass Strait to Tasmania on a (relatively light weight) 23ft Norwalk Island Sharpie in severe storm conditions, a trip he seemed to enjoy but I suspect his sailing companion may not have! He told me that when they needed to rest up they just dropped the sails and lifted the centreboard and let the boat drift while he put the kettle on. His point was that with no keel down the boat wouldn’t trip up over itself and capsize, and instead just scooted over the waves until they were ready to sail again. Robert also pointed out that for centuries people sailed the oceans in boats with little lateral resistance and were able to ride out the worst of weather in their ‘primitive’ ships. The American designer Phil Bolger used a similar rationale for some of his designs too, preferring that they float on the water rather than through it. 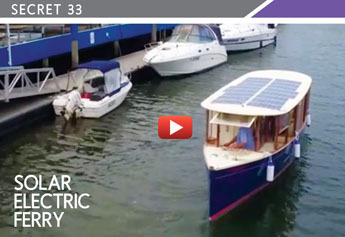 The use of internal water ballast in conjunction with a retractable centreboard or leeboards is in my opinion the optimum system for smaller sailboats as it allows the boat to be ballasted up when necessary and allows the ballast to be easily removed for trailing or sailing in light winds. Also because water ballast is neutrally buoyant it will not sink the boat if it does become completely swamped. Water ballast tanks do add another level of complexity (and therefore time and cost) to any project but are well worth considering. There aren’t as many designs available with water ballast as other types but they are available, designs like Ebihen (blue hull left) as well as the Bay Raiders feature water ballast tanks. One downside of centreboards is that they can break up the space in a cockpit or cabin, in some designs like the Jewell the centreboard case is located under the cockpit sole with only a small protrusion into the cabinwhich is used as a step. 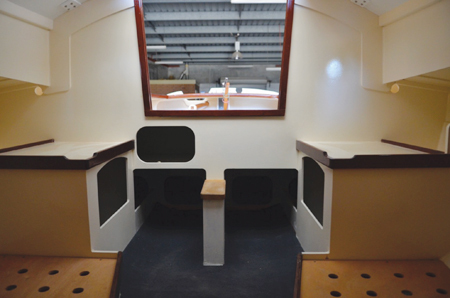 Ian Oughtred used clever solution to this problem on his Eun na Mara design, in this design he uses twin boards,one either side of the cabin, and the cases are built into the internal furniture resulting in a clean uncluttered cabin sole. One other solution which is often overlooked is the use of leeboards. Although many people are suspicious of leeboards, they have been used for centuries on traditional sailing barges in Holland as well as on the Thames barges, and are thought to have originated in China over a thousand years ago. The main advantage of leeboards for these barges is that they didn’t take up valuable space in the hold and also there is no need to worry about leaky centreboard cases inside the boat. Here in Western Australia my friend Kurt Stenross not only builds his own boats but has also designed several boats up to a 34ft gaff yawl. Kurt is a big advocate for leeboards both for the convenience of not having a case cluttering up the cabin but he also feels that they are superior to centreboards as leeway preventers. 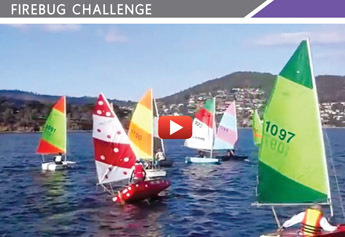 There are many aspects to leeboard design, angle relative to the centreline of the boat, the angle they are canted outboard to be perpendicular to the water when sailing, weight and lifting mechanism, as well as length and width which affects the centre of lateral resistance when the board is partly raised in shallow water so there is plenty of scope for tinkering. Ultimately there is no definitive answer to the quest for the perfect boat, (but you probably knew that already). 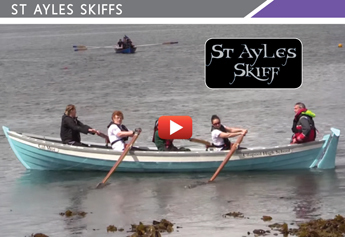 Every person has a different idea of aesthetics, different sailing requirements and abilities, as well as available building space and the skills to build a boat. So the best advice I can honestly give anyone is to read as much as you can, contact anyone you can find who has built a similar type of boat or sails in the same area you are looking to sail in (online forums are very useful for this) and, ... well ... jump in and see how you go! And, because inside all of us the desire of youth still rests somewhere, you will always find that there will be people who are willing to help.